The period of childhood before education. Apprenticeship and wok was short, but not totally non-existent. Various toys have survived. Such as balls, tops, dolls and figures of animals with moving parts, not dissimilar to wooden playthings given to children today. There are also depictions of boys and girls engaged in group activities such as athletic games, mock battles with sticks and gymnastic dancing. Other sporting activities which were encourage, at least among the royal family and nobility were swimming, archery and horsemanship. Education in ancient Egypt was largely vocational an apprenticeship served within the family trade or craft usually under the boy's father. We know something of the system from the craftsman's community of Dier el-Medina. Boys were taught skills by their father in the hope of at least on son winning a place in the official corps of tomb-builders. Those youths who were most likely to be accepted were designated 'children of the tomb'. They were attached to one of the gangs to do odd jobs and run, but no doubt primarily to watch and learn until such time as a place became available for them. Offspring who failed to achieve one of these coveted, lucrative positions had to leave the village, either to set up as craftsmen elsewhere or to seek a different type of job. A more formal, academic - ancient Egyptian education was reserved for those who trained to b scribes. Elementary schooling for these privileged children, mostly boys, began at about five years of age and consisted of repeated recitation of lessons as well as the copying of standard texts. The basic proper may have been a book called Kemty, which means' completion;. The form and style of the surviving copies of this work indicate that it was composed in the Middle Kingdom, although it was still used a thousand years later. The reason for its continued popularity as a teaching book was the simplicity of its language and the fact that the text was set out in vertical columns rather than horizontal lines, so that the signs were easier for young children to copy. The contents of the Kemty consisted of model letters phrases and expressions useful to scribes, plus 4assorted wisdom texts giving advice to would be scholars. Having mastered the basics, the student in ancient Egyptian education could progress to more advanced text. The majority of these were classics of Egyptian literature; in particular the wisdom texts full of pronouncements on morals and behavior for young men who hoped to achieve some position in life. This genre and a long history in Egypt. The sage Imhotep wrote such a work, now lost, in the Third Dynasty and the latest surviving example, the instructions of Onkhsheshongy, is probably Ptolemaic. These wisdom texts are couched in the form of a discourse from a learned master, father or teacher to his pupil, A fair amount of the advice they contained inspired the scholar to diligence. In the words of the scribe Amenemope, pass on day in idleness or you will be beaten. The ear of a boy is on his back. He listens when he is beaten. A further source of information on the education, favored statues and potential power of the scribe is to be found in the Miscellanies a group of short compositions collected on rolls of papyrus, these consist of texts, often in the form of open letters. Concerning the workings of administration and the life of the upper middle class of Egyptian society. They are full of unusual and technical language, mathematical problems and lists of exotica, as t he Kemty forms the basic primer so the Miscellanies must represent the final stages of the scribe's education. 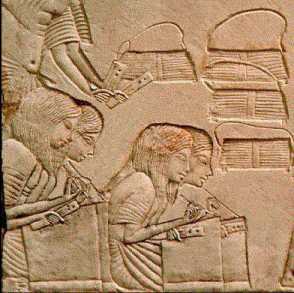 The final years of scribal training were probably vocational, wither working with a master or attending on of the specialized schools run by the major employers of scribes such as the royal palace, government departments, the army or temples, In these schools the trainee would receive knowledge applicable to jobs future employment: mathematics anqad surviving for tax assessors, ritual practices or medicine for future priests, and so on. At the other end of the social scale and at the lowest level of an Egyptian household were the servants and salves who performed all the mundane duties, but who received little reward. 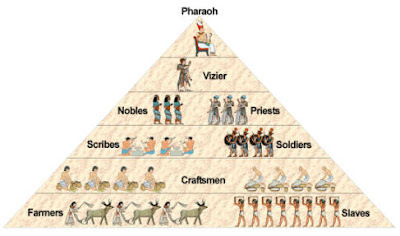 To a certain extent the whole of Egypt was in a state of servitude, for the structure of society was hierarchical and everyone owned duty to someone at a higher level, and ultimately to Pharaoh, who was the embodiment of the State, Nevertheless. at the bottom of the heap it becomes difficult to differentiate be teen the oppressed peasant labourer and those officially designated as slaves. Unskilled peasant farmer were attached o an estate belonging to Pharaoh, the government, a temple or a rich landowner. Their pay was barely more than subsistence or, of they cultivated land, a large percentage of the harvest was taken in rent and taxes, and this group of people was the main target of Corvée duty. Forced labour raised specific tasks such as the upkeep of irrigation system construction of public buildings and cultivation of land, for this work no pay at all was received, only keep. All but he official classes were obliged to undertaker the Corvée, but anyone who cloud afford to do so would pay for exemption this ensuring that the weight of the burden fell on the poor. If, however, the Corvée workers attempted to run away from their labour, they were classed as fugitives and, if caught sentenced to permanent servitude spending the time between jobs on prison, their children then seem to have inherited the parents' status as State servants. These unfortunates bridge the gap between the theoretically free peasants and the lowest class of Egyptian society, the slaves, Slavery is known to have existed in Egypt from the Middle Kingdom onwards. The majority of slaves were foreigners, wither Asia tics of Nubian usually captured in war, although some were brought into the country by merchants. 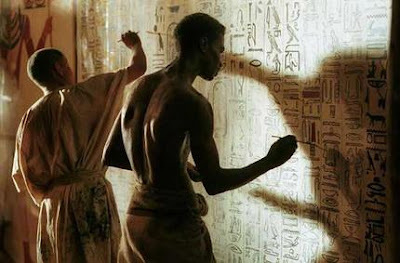 There are a number of terms in Egyptian designating slaves , which basically different between household and agricultural workers, Slaves could be bought sold and threadlike any pother chattel. yet in the whole they appear to have been well treated and there are even examples of emancipated slaves marrying into their former owner's family .The majority of slaves were female, employed in domestic tasks . yet not all domestic workers were slaves ; many personal servants , as far as we can tell , were free to leave their employer or could be dismissed.